January 15, 2007: Can you see 7 dolphins in this picture? This is so pretty! I love dolphin! 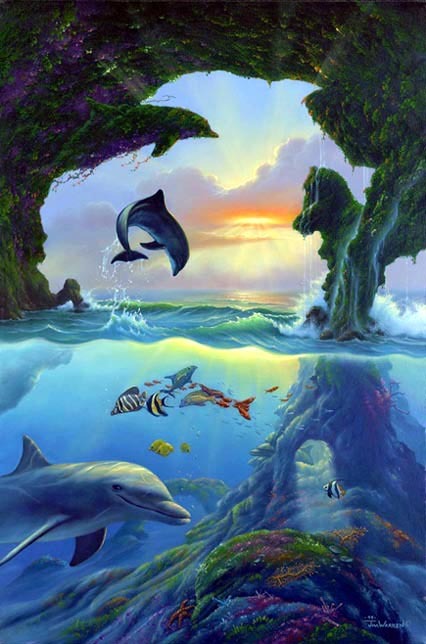 This picture is full of love... wat a lovely dolphins... >_< dolphins are my favourite... I LOVE DOLPHINS!!! paint application is good, but over all composition is not aesthetically pleasing to the eye. The use of color is over done. It would be more unique if you put something unexpected. For example, exaggerating a part of an animal or even making one of the objects out of portion.